Join The All New Get Smart FanFic Mailing list Right Here! Part Two of "No Time for Spies is Here! Read the Return of the Smartian Controversies! Check out other Get Smart Sites! What is "Get Smart"? A new phonics program? An insult that I’m tossing out to everyone that passes by? Could it possibly be my collection of English 201 papers that I’ve decided to post to the internet? Absolutely, positively, definitely..... NO! For your information, Get Smart is the most awesome show known to man! You can find out what the show was about by clicking on my site map Then after you’re all done getting smart about Get Smart, you can check out my picture page and my reference guide. 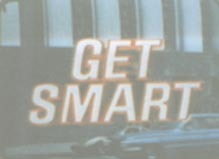 You can get even smarter by checking out all the cool Get Smart pages listed on my Links page. This site is under eternal construction -meaning I'm always updating! In the mean time, head on into my branch of Control Headquarters and have a ball!